The Agricultural Development Bank (ADB) has presented a dummy cheque of an amount of Four Hundred and Eighty Thousand Ghana Cedis (GHS480, 000.00) as sponsorship package for the 2018 National Best Farmer. The amount which is the estimated cedi equivalent of One Hundred Thousand United States Dollars (US$100,000.00) has been the lead sponsorship package by the Bank for the past 17 years. Making the presentation at the premises of the Ministry of Food and Agriculture in Accra, the Managing Director of the Bank, Dr. John Kofi Mensah said ADB remains the most committed Bank towards the growth of the agricultural sector in Ghana. 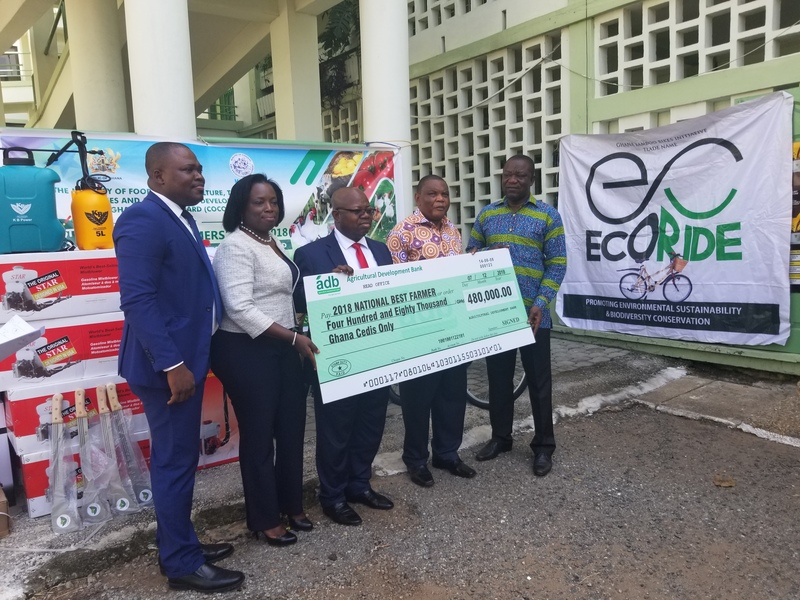 Dr. Mensah said the presentation of the dummy cheque was a symbolic gesture of the Banks commitment and readiness to fulfill its social obligation to the 2018 National Best Farmer. “We have been performing this key Corporate Social Responsibility since 2001 as a way of encouraging the youth into farming and making the Farming profession more attractive,” He said. He indicated that the Bank for 15 years has been presenting a three bedroom furnished house to the National Best Farmer but to inject innovation and also afford the Best Farmer the opportunity to expand his or her business the Bank in consultation with the Ministry of Food and Agriculture decided last year to present the Best Farmer with the cash prize to aide in the expansion of his business. 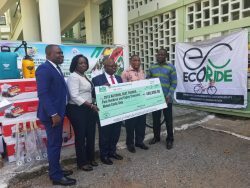 “Last year we presented the overall Best Farmer with a cash prize to enable him expand his business and we are convinced it really went a long way in helping Mr. Agyemang to expand his business, he said”. According to Dr. Mensah aside being the lead sponsor, the Bank also sponsors the Welcome Cocktail and the National Farmers’ Forum. Dr. Mensah said the National Farmers’ Forum provides the award winners the opportunity to engage stakeholders and Policy Makers from the Ministry of Food and Agriculture, Ministry of Fisheries and Aquaculture and Financiers to deliberate on key issues related to the sector. “The Forum affords our Farmers and Fishers the opportunity to discuss key issues with Policy Makers and come out with recommendations needed for the growth of the sector,” he said. Receiving the donation, the Minister of State in Charge of Food & Agriculture, Hon. Dr. Gyiele Nurah commended ADB for the kind gesture of sponsoring the Farmers Day with One Hundred Thousand United States Dollars (US$100,000.00) for the past 17 years. “ADB has been the title sponsor for the past 17 years and we wish to commend them for keeping faith with the National Farmers’ Day Celebration, he said.